21 March is World Down Syndrome Day! 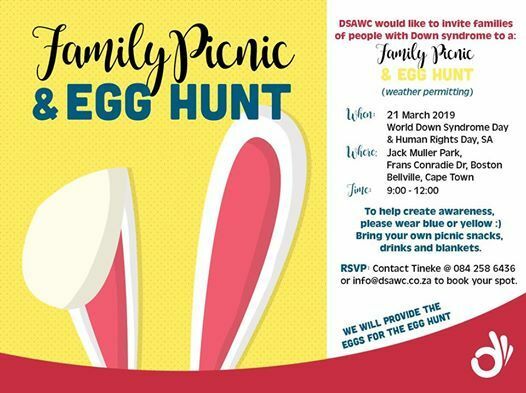 DSAWC would like to invite families of people with Down syndrome to a Family Picnic and Egg Hunt (weather permitting) on Thursday, the 21st of March 2019, 9:00 - 12:00 @ Jack Muller Park, Frans Conradie Dr., Boston, Bellville. Contact Tineke at 084 258 6436 / aW5mbyB8IGRzYXdjICEgY28gISB6YQ== to RSVP. 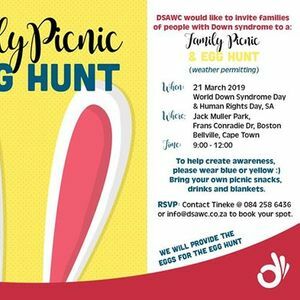 To help create awareness, please wear blue or yellow :) Bring your own picnic snacks, drinks and blanket. We will provide the Easter eggs for the egg hunt. Hope to see you there!